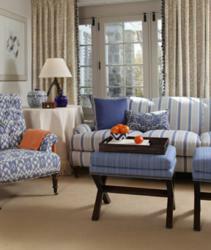 Ikat fabrics may be a hot trend in home designbut there are very few genuine ikats actually used to create those looks. “That’s no longer the case,” states Lori Cropp, merchandise manager for the Calico Corners Calico Home stores across the country. “We’ve introduced a rich assortment of hand-tied and dyed ikat fabrics at Calico, all created in weaving villages in south India. The true beauty of ikat is that it’s not a print, notes Kiran Singh, who began importing ikats from his native India 30 years ago. “Since each motif is individually hand-wrapped, no two motifs are exactly alike,” he explains. “It is this subtle variation in the motifs that gives the fabric its rich, organic look.” Every inch of fabric has been created by the hand and eye of the weavernot by a CAD system or a high-speed loom. Working with wife Laura, the Singhs have built a wholesale fabric business weaving in India, and sell to the Calico stores, among others. They have revived the craft of ikat and hand-block style prints, finding that “the thrill for us lies in bringing contemporary colors and shapes to this ancient textile process,” notes Laura. For many years, the Singhs collected antique wood blocks that were used to print fabrics. The challenge of printing with carved blocks is that the repeat and color are a bit inconsistent because of the varying pressure applied to the blocks on the fabric. The solution was to base new designs on the old blocks, and to cut the pattern into a larger silk screen that didn’t have to be delicately pin-matched, like wood blocks.